Slate. It’s one of the most beautiful choices you can make for your home flooring. It’s also one of the most natural. Slate can enhance the appearance and style of any room in your home. And because of its durability, it is often one of the best choices you can for your bathroom, laundry room, and kitchen. 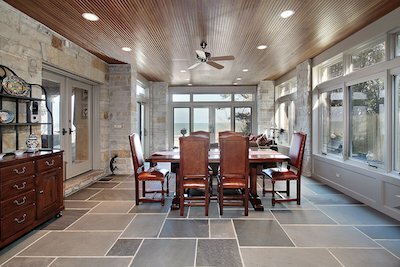 Why should you consider slate for your flooring? One of the reasons slate is becoming a top choice for flooring in the bathroom or kitchen is because it is waterproof. Slate’s natural water resistant properties are great for withstanding splashes and spills. It’s also why more laundry rooms are utilizing slate as well. Because slate isn’t as smooth as other tiles, the texture prevents slipping more than other tile flooring options. Keep in mind that slate does often come with slightly uneven surfaces, which can make it more challenging for elderly or others that are at risk of falling. While slate may be more expensive at the time of installation, its longevity makes up for it in the long term. Slate lasts for longer periods of time than that of other flooring material. Because slate is a natural product, no two tiles will ever be the same. Every slab of slate is mined for use was formed differently than others. Each tile will have beautiful variation in the color, pattern, texture, etc. Which means that your floor will be uniquely your own. Slate is one of the best transmitters of heat. If you’ve had the desire to install a heated subfloor, slate is a great option to lay over your radiant heating system. Think slate flooring may be the perfect choice for your home? Stop by and see the many styles available to you today.